Hello to You, Ghet via NYTimes Readers! Good morning, Atlanta! There’s more than a few of you who have clicked onto our site via TheGhet.com, after reading the NYTimes piece on anti-restaurants this morning. 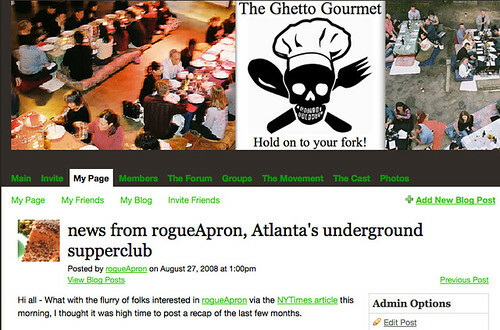 Welcome to rogueApron, Atlanta’s happily unpretentious underground supperclub/anti-restaurant/social dining experience. We put on delicious dinners for strangers-who-become-friends, paired with awesome homebrewed beers, and located in different private locations on a semi-monthly basis. If you’re interested in joining a future event – one will be announced shortly – please join our mailing list. There’s quite a bit of info our our site, so please feel free to navigate around! When folks join our mailing list, we ask them for cooking inspiration ideas. 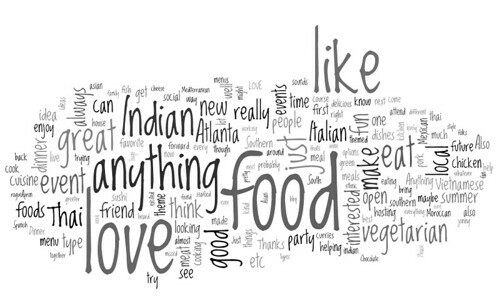 We pasted nearly 600 responses into Wordle.net, which created this little word cloud. Neat, huh? To view this full-size, just click on the image. Why did you create rogueApron? Atlanta needed a social dining experience! There are a lot of amazing people doing good work in this town, and rogueApron is just one of many opportunities for people to connect over a shared meal and some pretty delicious beer. We’re so excited about the potential for future events; working with other creative folks to create awesome experiences. We have grown exponentially since our first event on St. Patrick’s Day this year. Our first event actually coincided with the tornado that hit downtown Atlanta and East Atlanta, where we were hosting. We crawled through downed trees and power lines in the pouring rain to go check on our homemade corned beef, which had been marinating in East Atlanta Brewery porter for two weeks. With a little ice, all was made well, and we moved the event to another day. We’ve had a lot of support since that exciting first dinner – there are a lot of rogueApron regulars like Rebecca, Broderick and Molly who have come to every event. Why is it an “underground” supperclub? That’s a hard question – rogueApron is only underground in the sense that any movement that is different from the status quo seems underground. We are actually quite ‘aboveground’ in the sense that we blog openly about the dinners, and maintain transparency about our process and sourcing. Anyone and everyone who is interested in driving to a stranger’s home for a good meal and better conversation is welcome to join us. We are ‘underground’ in the sense that we are trying to separate art from commerce – to remove the business aspects of dining out. Our guests are guests, not paying customers; we shop for ingredients based on quality, not profit margins; and our servers, cooks, and greeters are all there because they want to support the project. Our guests come back in the kitchen to shake your hand and thank you for the meal and the experience, instead of just handing over their credit card. For some reason, cooking food with love for other people is underground. We have events of all sizes – from intimate interactive ‘roll your own sushi’ parties, to larger 50 person events. Our last event, Mama Mediterranean, was our biggest, with 60 diners and about 10 folks who volunteered to help us with cooking and serving. In general, folks find out about us via word of mouth or friends, and join our email mailing list. When a new event/date is announced, we email our list, and folks make a reservation. The entire experience is strangers with a shared love of food coming together to throw a dinner party for one evening. So, it’s all volunteer-run -cooks, servers, and dishwashers. We also partner with small businesses, who trade us services or loan us items in order to make the evenings super-special. 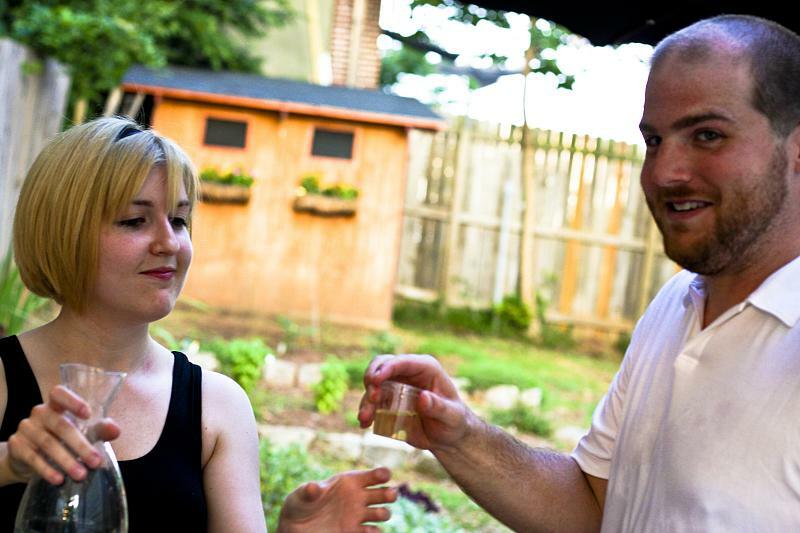 Once folks arrive, we welcome them with an infused liquor shot, and encourage them to mingle or enjoy an adult beverage. 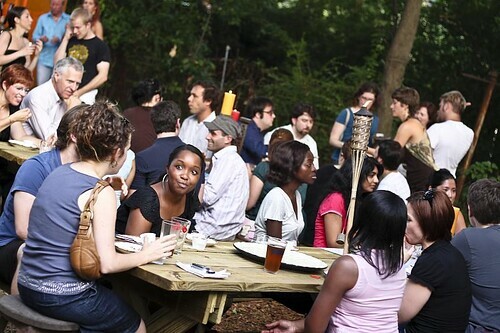 We have a mix of really awesome regulars and newbies – folks come alone, in pairs or groups. Depending on how formal the theme is, food is either plated buffet-line style, or formally in the kitchen, and then run out to folks with servers. We try really hard to create an accessible experience for everyone, so there is always a vegan or vegetarian option for any meat-based dish. So far, events have been monthly. There is a lot of interest in the project, so we’re hoping to hold them more often. How is rogueApron different from other “underground” groups? I suppose the generic answer is that we are trying to be as welcoming and inclusive as possible. We’ll always have tasty vegan and vegetarian options for our guests who don’t eat meat, and we’ll happily cook up a separate dish for someone with food allergies (with enough notice, of course.) We try to be discreet and open at the same time. How is it different from other supperclubs? The people who come to rogueApron events are what makes the experience great. We have such a diverse mix of regulars and newbies – and our regulars have really become like family to me. I think that people coming to an event for the first time – even by themselves – will quickly meet friends, and that’s all because of the awesome caliber of folks who support the project. What will happen if your identies are revealed? Why and how will this effect rogueApron? Most of the guests who know our real identities understand our need for anonymity – we get so many emails and questions, and it would be hard to have that kind of attention in our personal lives. How has all the recent publicity affected the group? So far, publicity has been really good to us. 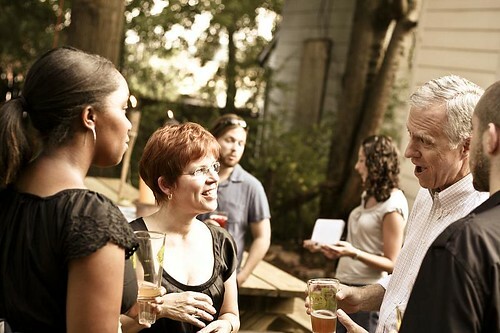 We had a lot of folks join our mailing list, and our last event was much more diverse as a result. We’ve also had an outpour of folks interested in participating in the project – by hosting or volunteering – and I hope we can start putting on events more frequently as a result. What demographic do you cater to? Hmmm … I would say that instead of us catering to a specific demographic, that it’s more the other way around … a certain type of person is interested in rogueApron. Our guests are passionate people, who are interested in new experiences, meeting new people, and eating great food! Please describe a typical event, from start to finish. Please include the planning that goes into it, before, during and after. Planning: is intense. From working with the hosts, securing volunteers, setting up the website, and planning the menu – it’s a lot of work. What is a typical meal like? There is no such thing as a typical meal! All meals are extraordinary! Every experience is different, and I don’t see any limits for what we can do. When do guests find out where the event will be held? How are they notified? We like to keep people on their toes as far as how we contact them -it’s just more fun. We use a combination of email, SMS, snail mail and voicemail to confirm reservations. People receive the address at the last moment. Anything else I should know. One of the best parts of rogueApron is collaborating with other young and locally owned businesses. Jessica Silverstein, who owns Urban Cottage in the Virginia Highlands, has been an invaluable partner. She lends us gorgeous stuff for the tables, like plates, candles, and Carla Kaiser‘s funky pinch pots. She’s an incredibly smart businesswoman, and I just love all of her great and creative ideas for transforming someone’s home into a welcoming dining experience. Carla Kaiser also does our signage, menus, and labels – seeing her handwriting in event photos just warms my heart. The East Atlanta Brewery guys are so talented, and I really love that people get to come out and taste their fabulous concoctions. OK, gang … I will post a recap of the Mama Mediterranean event later. 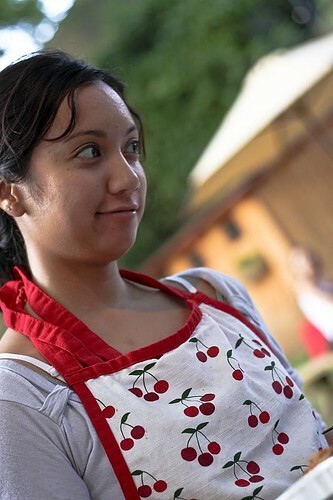 If you joined us, sign the guestbook, add your photos to our Flickr pool, and sign up for a friends of rogueApron account, so you can get first crack at RSVPs for future events.